Duke Hall Gallery of Fine Art at James Madison University will open the group exhibition called Record Keepers from 5-7p on Monday, 22 October 2018. Curated by Artist and Master-printer, Anna Hoberman from New York City and John Ros, Duke Hall Gallery of Fine Art Director and Chief Curator, the exhibit focuses on artists who strive to preserve current events and historical ones within our social landscape by-way-of the edition and working with multiples. Featured artists include: Alix Lambert, Allan McCollum, Aurora De Armedi, Azikiwe Mohammed, Elizabeth Moran, Emma Nishimura and Jo Baer. Artwork by Francisco Goya and Robert Rauschenberg will also be on view to help provide historical context for this contemporary exhibit. The exhibit will be on view through Saturday, 01 December 2018. Since before the Renaissance, prints have enabled artists to disseminate their work and perspectives throughout the world. A print, unlike other types of art, can exist in multiple places at the same time. Editions have played, and continue to aid, an important role of documenting and testifying to the existence of events. This documentary ability puts a print into the realms of an archive. The archive is an accumulation and preservation of records, documents and primary sources. Artists take on the role of cultural archivist — pulling from, referencing, preserving and collecting artifacts. Prints hold power in numbers, their ability to be mass-produced and distributed links the medium to revolt, revolutions and political movements. From posters and manifestos, to clothing and banners, if it can be multiplied then it can be distributed and dissemination has begins. 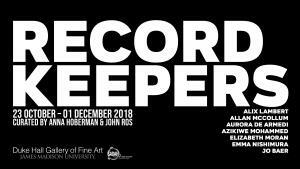 Record Keepers is an Encore Series Exhibition in collaboration with the Printmaking Program at the School of Art, Design and Art History. It is also made possible by the generous donations and loans from three private collectors who wish to remain anonymous. Special thanks to: Donald Taglialatella, World House Editions, Middlebury CT and Judith Solodkin, SOLO Impression Inc, Bronx, NY. A special limited edition series of prints by JMU Printmaking students will be available in the Gallery Gift Shop. All proceeds will benefit future gallery programming. A few special artist works will also be available in the Gift Shop. ANNA HOBERMAN // Anna Hoberman (Brooklyn, NY) received her undergraduate degree in studio art/printmaking from Skidmore College, and Masters of Fine Arts from Brooklyn College. She attended the Tamarind Institute for professional printer training in lithography and has assisted at several printshops including: Island Press, Solo Impression, Milestone Graphics and the Lower East Side Printshop. In addition to running her own contract shop, Afternoon Editions, she is an Adjunct Professor of Printmaking at New York University and Parsons - The New School. Her prints have recently been shown at, Silvermine Arts Center, CT, IPCNY, Savery Gallery, PA, and included in the collection of the Museu do Douro, Portugal. GALLERY INFO // Duke Hall Gallery of Fine Art’s mission is to present the highest level of fine art experiences and to create an active space for robust discourse of vital issues facing our society. It is a space where the local community and academic community share ideas about contemporary art and our wider cultural experiences. Art breaks barriers between languages and brings us together to be inspired and knowledgeable citizens, no matter where we come from.